There was a time I almost did something that I didn’t give much thought for only because it was said to be the "norm" in this specific area of business practice. But then, thankfully, I went back to my themes to see if this action (that I was about to take) was aligned with what I aimed for this year. The jury is still out. But, I sense that I made the right decision from the feedback I received. Why did I almost get brought into an idea that wasn't aligned with my values? Simple. It was a hot topic, and I heard about it everyday. This led me to subconsciously make a large assumption in my head that, "This is a thing to do." It was exactly like that. I was almost brainwashed to the point where I believed this was the thing to do. By the way, record labels are obsessed with how many “spins” per week they get for their priority track from radio stations across the country for this very reason. The more they get radio stations to play their song, the more likely that they will win over more people. It’s a classic tactic. I know this all too well as I was in the industry for over a decade. Entrepreneurship comes with enough risks. We are ever-so-slightly insane to take a chance on it. However, if we allow our reactive and impulsive emotions to take over our lives, we would be spending an enormous amount of time course correcting later. Imagine how much time you would lose by doing so, and how much progress you could have made with the same amount of time if you avoided it. Talk about pain… This is a kind of pain we can completely avoid. In this post, I'll share my process to come up with themes that help you cut the noise and stay focused on your big long-term visions for your business. First Thing First: This is a Creative Process. The same word can mean different things to different people. You are not doing this exercise for others. You are doing this for you. During this exercise, you will know which word feels right. It is OK to break up the process over a week or even longer if you need time to think and digest what you’ve written. What's the difference and why themes matter? First, themes come before goals. It's a manifestation of where you want your business to be. Once I have my themes down, I can come up with a game plan for each that is aligned with my themes rather easily. Themes are your North Star. These are the words you can fall back on to remind yourself why you are doing what you are doing when things get tough in your business. Second, themes enable you to mentally set the right tone for the year. Even when you find yourself overwhelmed with many new ideas, you will always know your way back to these themes without getting stuck or being paralyzed. Themes are your "why" and/or "how." Here's the challenge. Coming up with effective themes isn't easy. Your head might tell you that you understand the concept of themes. But, until you actually put it into practice, you don't know what you don't know. 1. Write down everything you have on your mind, however small until you run out of words. 2. Think of why they are important to you and how you would feel if you are to attain or achieve them. 3. Group them by finding commonality among those words, then narrow them down to 3 groups. 4. Consolidate by eliminating repetitive words. 5. Look at each group and find a theme that represents each group. It seems deceptively simple, but you are going to take a deep dive into a journey of why these are coming to your mind. Don’t be surprised if you come out of this exercise with a completely different perspective as to how you plan to design your next year. After going over the process I outlined here, I will walk you through with my own themes for the next year. I will explain how I arrived at these words so that you will get a better idea as to how to put this process in practice. Start from What Comes to Your Mind. Do you have a whiteboard? If not, no problem. Just pull out some recycled papers or your notebook and a pen. You are using a pen because it will prevent you from erasing any of them. There are no right or wrong words. It is impossible for you to make any mistakes. So, use a pen. Why not do it on your computer? It is because the act of writing by hand has a bigger impact on your brain to think critically and creatively. Simply, writing by hand is more effective to make this exercise worthwhile. It is OK to start from obvious ones that hang over your head all the time. Remember, you are NOT writing down your typical goal-oriented words. Instead, you are writing down everything you have on your mind. Is something bothering you? Write it down. Something you want? Write it down. Something that you want to get rid of? Write it down. Don't over think. This step reveals your honest feelings and thoughts, and this truly matters for this process to work. Why These? How Do They Make You Feel? Here, we are going to take a step further. What you are describing is "what" you want. These are goals. Don’t worry, this is part of the process. Do you have something like these? These are not clear-cut goals per se. Some of them can be. If you have something similar to these, you are already thinking beyond immediate goals. You may be describing your current feelings. You may be searching for words to describe solutions. Overall these may not make much sense to you right now, but eventually they will all come together. Now, I want you to write down why these matter to you. Also, think about the feeling you may experience if these things are attained or achieved. Key here is to keep it very brief and short. Avoid writing in sentences. Let’s take a look at the below example so that you know what I mean. Possible answers: In control / Attractive / Free / Confident / Love myself again / Proud / Knowing I’m OK.
Overused words such as health, money, family, will not stick in your mind. They will just go over your head. Or, you will wave your hand up and down and brush it off by saying, "Yeah, yeah, yeah." That is the reason goal setting does not work most of the time. Check out this post which I wrote extensively about why I avoid using the word “goals” in this post. This is not to say that you need to come up with some mysterious, cryptic keywords. However, I will say that you need to see beyond obvious words that muddy your intention. At this stage, you could walk away to give yourself a break. You can also keep going if you don’t need one. By now, you have so many words written you may have a few pages worth of words. Before you do anything to them, I want you to just stare at them. This is the stage where you start to look for patterns. All of the words may lead to one thing. In my case, I saw roughly 5 different categories. Try finding a common thread in these words. If you find more than 3 categories like I did, try consolidating down to 3. 1. Words that lead to the same mindset required to attain or achieve what you ultimately want. 2. Words that lead to the same action required to attain or achieve what you ultimately want. 3. Words that outline a process when they are grouped together. If you are unclear, read on. As I mentioned earlier, I am going to use my own examples to help you understand the grouping process. You will start to see some words that can be eliminated. I purposely put this step after the grouping process just so that it is easier for you to see repetitive words. There is no one way to consolidate. In the beginning of this post, I mentioned that this is a creative process and that you need to listen to your gut. You will start to see which words jump out more than others. Go with the flow. By staring at these words for long enough, some words will jump out more than the rest. That is what you are looking for. Don’t try to save the ones that don’t jump out. You can pretty much cut them all off. As you recall, themes represent why and/or how to attain or achieve what you want. Themes should be intentional "trigger words" that help you snap out of wherever the mental place you are in to refocus on types of actions that are truly important. Once you cut down the numbers of words per group, you will start to see a “theme.” How do you know if it is right for you? You will know by feeling a strong connection with each theme. Intention matters. Prep matters. Themes you choose matter. Spending ample time to search for the words that resonate with you is essential. Otherwise, your themes will not serve as North Star when you are lost and distracted by shiny objects. Let me walk you through mine so that it gives you a better idea of how to reorganize all of these precious words. I settled on the word, exposure, to summarize my general intent to focus on getting my work out. This year wasn't about maximizing my visibility effort. It wasn't the time while I re-worked the core foundation for my business. It's not me saying, "It's not the right time" out of fear. There are things that needed to be done before I could get to any visibility/exposure opportunities. That's why, intentionally, I did not focus on it this year. What I do is to look at these words to find a pattern or a theme. From the above, I tried figuring out what word would represent all of them. Exposure was it. Not only does it cover all of the words, but it also puts deeper meaning to what I want to achieve. Exposure reminds me to make myself “available." Also, the word reminds me of being transparent as in "being exposed." I'm purposely avoiding the phrase, "being vulnerable." It simply does not represent who I am. However, being honest and being transparent are something I stand for. Being exposed would put me to the test at all times. “Being exposed” sounds negative to some. However, to me, it gives me an edge. The word puts me in “game mode.” Exposure challenges me to stay honest, true to my feelings, and stay... "raw." By the way, a little side note, “raw” is what I came up with when I was listening to a podcast episode where Evan Carmichael talked about his book, “Your One Word: The Powerful Secret to Creating a Business and Life that Matter.” The book asks you to come up with only one word to summarize who you are. There were words I wrote down first and thought these could be categorized under "Roots." "Roots" will force me to look at areas I've been neglecting for the longest time. My family members endure a great amount of pain by putting up with me way more than I care to admit. My availability has been scarce, to say the least. No one lives forever, and I feel that, if I don't make this one of the themes, I will regret it forever. I also needed to find a word that would help me concentrate on my core value and vision for my business and for my life. When I was working on this exercise, my strong wish was not to be derailed by things that had no effect on my long-term vision. 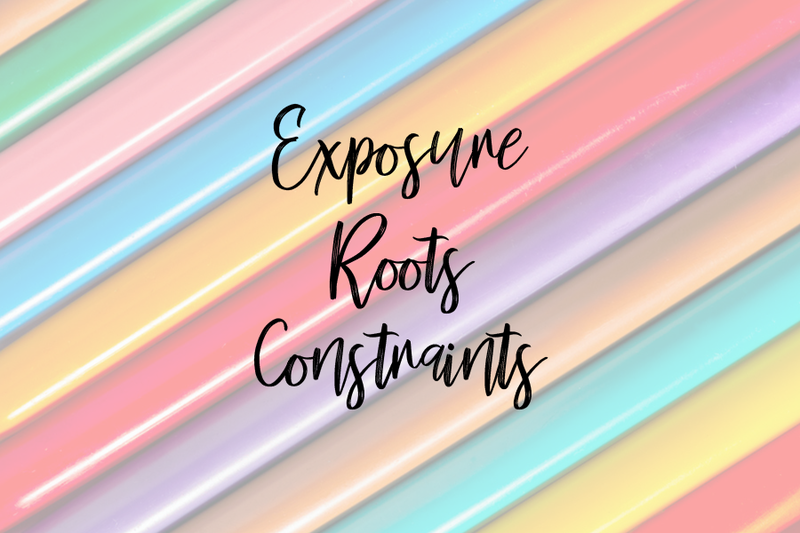 The word "Roots" will set me straight every time I feel disconnected or disjointed from what I truly wasn't in my life. It may look like I'm coasting through the process. But, I wasn’t. There was a tiny challenge. I was torn between "Roots" and "Acceptance." I felt "Acceptance" was a concept I needed to look into because I was battling with the reality that I could not change. I was resisting the idea of accepting some things that were inevitable. 1. Aging of my parents. 2. What I've done vs. What I could have done. 3. Where I am vs. Where I could have been. First, I had to admit the fact that I was resisting. I made a mental note that I need to continuously work on this. Second, I thought about which would most likely be less to the other. Acceptance --> Roots, or Roots --> Acceptance. The reason I chose Roots over Acceptance was that Roots covered more meanings for me personally including acceptance. If I take a closer look at who I am, where I came from, whom I have, eventually, I will have to face the notion of acceptance. It was a compromise, but I was adamant about keeping only 3 themes. Constraints, perhaps, is the hardest one to decipher if you are to reverse engineer the process. I chose this to strip everything down to set harder constraints on things I want to achieve so that I have no choice but to figure out creative solutions I can leverage. Instead of seeing constraints as hurdles, I want to see them as opportunities. It's closely connected to Roots. Strip everything down to bare bone to see what I could not see before. The concept of working a way around constraints always fascinated me as I feel a bit of romanticism surrounding the idea. I am on the same team with those who believe creativity is born out of constraints. Constraints make us grow faster. By having some rules in place, I will be aligned with my overall life theme of live with less. Also, this word prevents me from chasing down numbers that mean nothing i.e. how many followers I have on my social media platforms and/or getting side-tracked by, once again, shiny stuff. Are You Ready to Work on Your Themes? By going through my example, I hope you now have a better idea of how to create your own themes. This exercise turned out to be quite therapeutic. I have words written all over like clues I'm supposed to decode. I'm having a conversation with myself. It's almost putting a puzzle together. It also helps to do some deep thinking. If I sat down only to figure out my goals, I would not have been able to come up with most of the words I shared with you here. Goals would not have led me to think about acceptance. I wouldn't have thought about constraints as a tool to focus. Now you understand clearly the difference between goals and themes. Once you have your themes set, print them in large, bold, fonts. Make sure you put them up everywhere. I would slap it on back of my phone, on my notebook, on a wall in my office, etc. 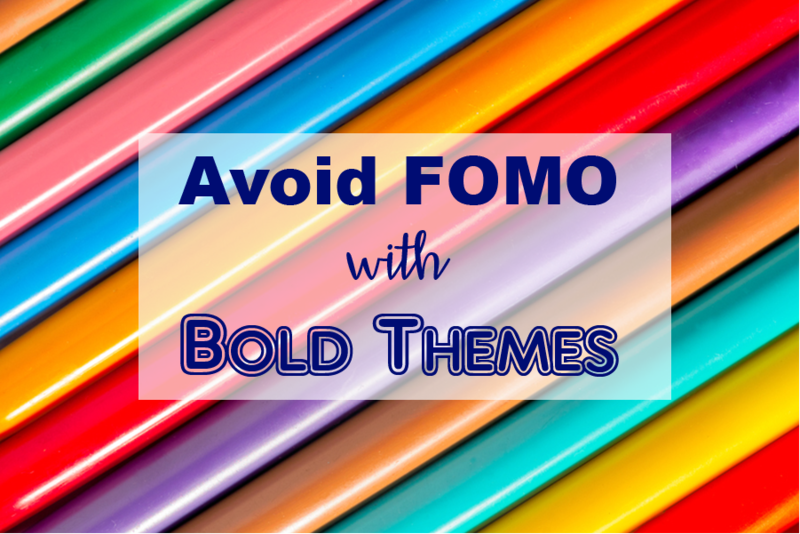 Your themes must be super visible. When you wake up, you look at them. During the day, you look at them. Before you go to bed, you look at them. This is why I prefer themes over a long affirmation. I want to save time by keeping only the short, clear, bold headlines. I can remember 3 words. Not 3 paragraphs or 11 bullet-points. You can even incorporate this into meditation, vision board, etc. You could also keep a journal based on these 3 on a daily basis. No doubt your words can be incredibly inspiring to others. It would be a treat to find words that I have never even thought about before. I bet there are many!